As temperatures drop, it’s time to winterize your backyard to make it a popular and safe place for birds. 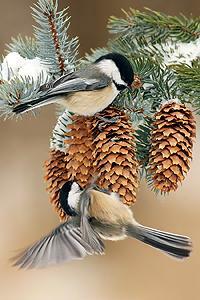 Birds need to stay warm and have adequate food and shelter during cold or stormy weather. What does your backyard provide? Here are some of the things you can provide for birds to weather out the chill and storms all winter long. Brush pile – this is very easy to create, and can be a needed shelter year round for birds. A brush pile that is at least several feet high and at least twice as wide, provides not only shelter from wind and the elements, but it is a safe haven for small birds who are hiding or escaping from a predator. Every yard should have a sturdy brush pile, and they are probably one of the simplest things you can provide to shelter your birds and keep them safe. For step by step instructions how to build one check out Audubon’s article. Roost box – Small birds like huddling together and can share their body heat in a small insulated space during cold weather, aka roost box. You can either provide a box which is designed as a roost box which you can make or purchase, or convert your birdhouses into roost boxes. Check out The Spruce for some info on how to do this. Native plantings – If you have been expanding your backyard native plant gardens to include a variety of plants, shrubs and trees, as these native plants and trees mature, they will provide fruit, seeds and shelter for birds visiting your backyard. You are still going to want to provide fresh seed in feeders, but the native plants and shrubs will give birds who visit your backyard a greater variety of food, and may attract birds which might not be interested in the seed in your feeder like Cedar Waxwings or other fruit eaters. Water – Birds need fresh, clean water year round. In cold weather birds dehydrate easily and are always looking for a source of fresh water. If you live in an area that freezes, be sure to get a heated birdbath. The heating element keeps at least part of the water open in bitter cold so birds can drink, and this should be an essential part of your backyard offering year round. Suet – The best food for birds in cold weather is suet. You can either make your own recipe which is great fun to do, or purchase blocks of it. Woodpeckers will be very grateful to you if you provide a feeder with a piece of wood below so they can rest their tail on it for balance. Check out some of these recipes from the Baltimore Bird Club. Roost pockets – these small woven baskets can be surprisingly effective in keeping small birds warm in winter. If you want to keep them especially cozy, try putting some wood chips in the bottom. Mulch – A little mulch spread around will go a long way in keeping worms and other yummy edibles available for your birds before the freeze and as spring arrives. Get your yard ready for birds now, and enjoy some nice winter viewing!